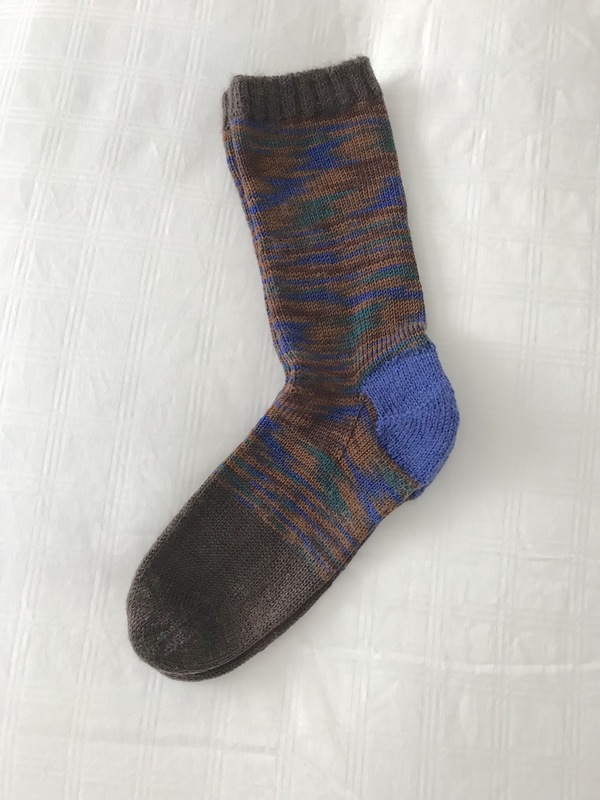 5-6 hours later and here’s a new pair of socks – restored with new heels (Click here for the socks before I reknit the heels). If you’re a dedicated knitter and want to know how I do it check out my instructions. Knitting a heel itself doesn’t take long – each heel takes about an hour – it’s all the preparation, picking up stitches on a carrier thread, carefully pulling out excess knitting (from the cut edge), and then finally grafting the instep onto the new heel (this last step requires slow careful stitching – done loose and then tightened just enough for an even finish, stitch by stitch). Obviously replacing heels goes a lot faster than reknitting an entire foot – but I can only get away with this easier repair if the holes aren’t too big. If the worn heel includes some of the instep, I have to cut off everything, retaining just the legs and building a new sock from there.